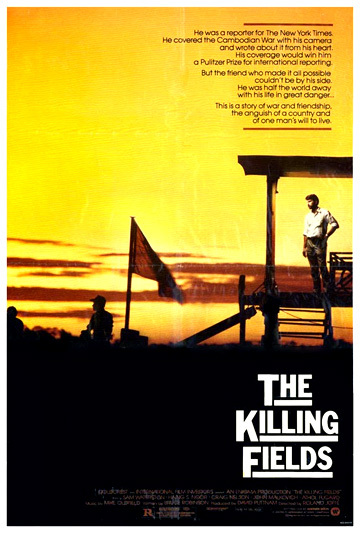 The Killing Fields (1984), a remarkable and deeply affecting film, is based upon a true story of friendship, loyalty, the horrors of war and survival, while following the historical events surrounding the US evacuation from Vietnam in 1975. It detailed the atrocities of Pol Pot's reign of terror in Cambodia in the 1970s. The authentic-looking, unforgettable epic film, directed by Roland Joffe (his first feature film) and produced by Britisher David Puttnam (the Oscar victor three years earlier for Chariots of Fire (1981)), was shot on location in Thailand (and Canada). He was a reporter for the New York Times. He covered the Cambodian War with his camera and wrote about it from his heart. His coverage would win him a Pulitzer Prize for international reporting. But the friend who made it all possible couldn't be by his side. He was half the world away with his life in great danger... This is a story of war and friendship, the anguish of a country and of one man's will to live. It was nominated for seven Academy Awards, including Best Picture, Best Actor (Sam Waterston), Best Director (first-timer Roland Joffe), and Best Screenplay Based on Material from Another Medium (Bruce Robinson) and won three Oscars: Best Supporting Actor (Haing S. Ngor), Best Cinematography (Chris Menges), and Best Film Editing (Jim Clark). Jonathan Demme's one-man show comedy Swimming to Cambodia (1987), a rambling 87 minute monologue, provides an elaborative account of Spalding Gray's experiences as a bit player (as a US consul) in The Killing Fields during the SE Asia shoot. "Cambodia. To many Westerners, it seemed a paradise. Another world, a secret world. But the war in neighboring Vietnam burst its borders, and the fighting soon spread to neutral Cambodia. In 1973, I went to cover this side-show struggle as a foreign correspondent of The New York Times. It was there in the war-torn country side amidst the fighting between government troops and the Khymer Rouge guerrillas, that I met my guide and interpreter, Dith Pran, a man who was to change my life in a country that I grew to love and pity." "So here we go with Voice of America. News for Southeast Asia. It's 6:45 and a partly cloudy morning here. Clouds too in Washington. President Nixon has announced that he will address the nation on the Watergate case within the next few days. The speech will be Mr. Nixon's first comments since May on the scandal that has resulted in resignations and nearly paralyzed the White House staff. It has also led to a tense confrontation, and perhaps a constitutional crisis, with Senate investigators and the special Watergate prosecutor. His speech was announced after the Gallup Poll disclosed that Mr. Nixon's popularity had fallen to the lowest point for an American President in 20 years..."
During the second narration, translator/interpreter Dith Pran (Dr. Haing S. Ngor) was driven to the Pochentong Airport in Phnom Penh to await the late arrival of NYT reporter Sydney Schanberg, although Dith Pran leaves suddenly to race to the hospital - presumably due to an unexpected US B-52 bombing nearby. The US reporter is there to cover the secret US bombing campaign in Cambodia, along with American cameraman Al Rockoff (John Malkovich) and English reporter Jon Swain (Julian Sands). He is one of the few American journalists left in Phnom Penh when the city falls to the Khymer Rouge guerrillas in 1975. After having persuaded his Cambodian assistant and friend Dith Pran to remain behind with him to help cover the story after the communist Khymer Rouge takeover and withdrawal of US military forces, Schanberg unintentionally betrays his aide by miscalculating the situation. They are separated and Pran is forced to remain when Schanberg and other American journalists and Westerners evacuate to escape a life-threatening situation in occupied-Cambodia during the fall of Phnom Penh in 1975. The film chronicles unforgettable scenes of suffering endured during the Cambodian bloodbath (known as "Year Zero") that killed 3 million Cambodians, when the courageous and indomitable Dith Pran endures the atrocities of the Pol Pot regime and is captured by the communist Khymer Rouge and punished for befriending the Americans. His struggle to stay alive in the rural, barbaric 're-education' labor camp, his two escape attempts from his captors, and his horrifying walk through the skeletal remains of the brutal massacres in the Valley of Death, the muddy "killing fields," all present potent apocalyptic images on his journey to Thailand. Sydney: (Do) You forgive me? Dith Pran: Nothing to forgive, Sydney, nothing. Dith Pran returned, with Sydney Schanberg, to America to be reunited with his family. He now works as a photographer for The New York Times where Sydney Schanberg is a columnist. Cambodia's torment has not yet ended. The refugee camps on the Thai border are still crowded with the children of the killing fields.